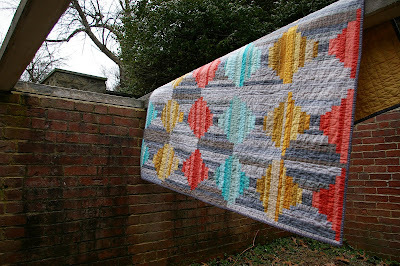 Blog Courthouse Steps Quilt Complete! Forgive me, there are going to be a lot of pictures. 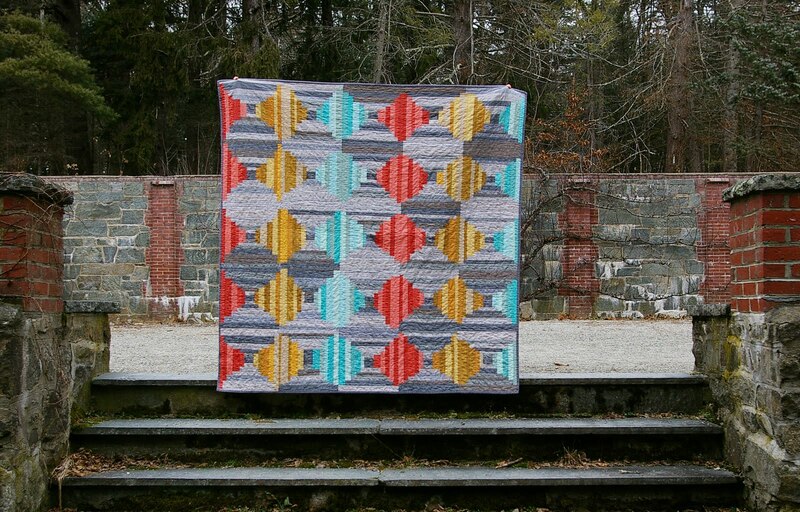 I enjoy taking pictures of completed quilts as much as I enjoy making them. My husband and daughter and I took a walk this morning at a local state park. Because it was so cold, we had the place to ourselves so we didn’t feel too silly taking quilt pictures! Above is one of my favorites. The quilt is hanging over the roof supports of an old greenhouse that is dug into the ground. Mark hopped in and took the picture. Here is the obligatory quilt roll shot. You can see the binding here. I am really happy with my binding choice. I love polka dot bindings and the greys in these dots work so well with the quilt. The fabric is Juicy Blossoms Grey Dot. The backing is pieced. I used the full width of Echo and then a strip of Kona Mustard with an improv pieced strip to fill out the width. I mentioned that I asked Rita for her opinion on the quilting. 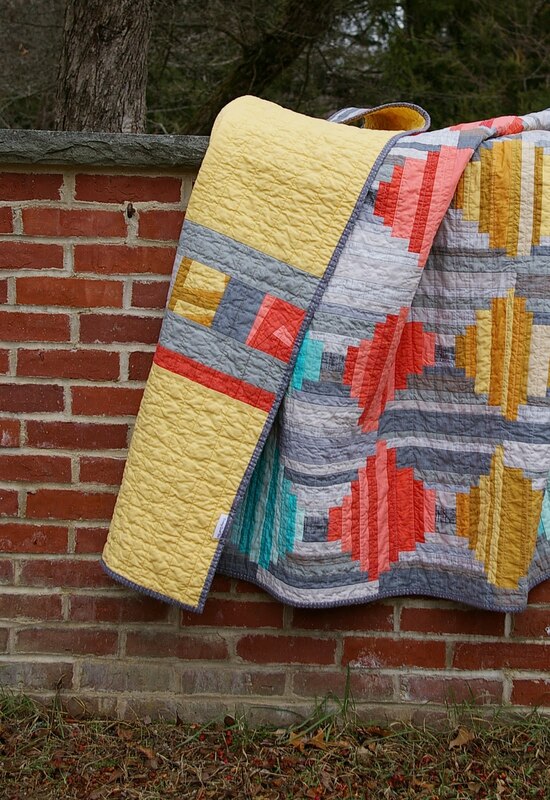 She suggested turning the quilt so that the colors are in vertical lines rather than horizontal. When I hung it on the barn, I hadn’t really thought much about direction. I was more anxious to get back inside where it was warm and to get a picture before the quilt blew away. Since the quilt measures 60″ square, it doesn’t really matter. But I did need to pick a direction since my backing print is directional. 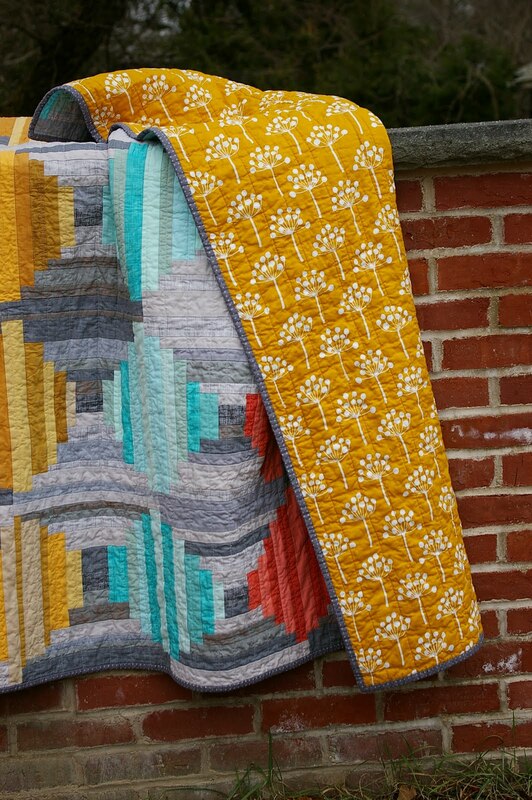 I looked at the quilt both ways and I decided to go with Rita’s suggestion because it makes the grey a more even player when it is hung this way. She suggested straight lines through the colored sections. I did this and also varied the width of the lines as I did the width of the steps in the piecing. I used a light grey thread on the top and a mustard thread in the bobbin. The spray basting worked well with the shifty materials and there are no puckers, front or back. I may be a convert. I found the majority of these fabrics at my go to source for solids, Marmalade Fabrics, where Tammy was kind enough to help me find the Orange Essex Linen and Red Yellow Cross Weave to coordinate with the Kona Coral. 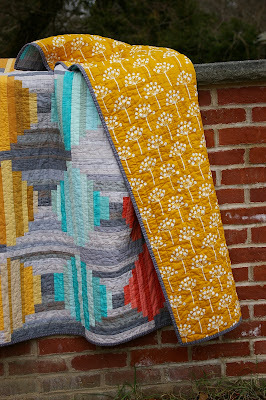 The other fabrics were purchased from the Fat Quarter Shop, Fresh Squeezed Fabrics, Sew Modern and Fresh Modern Fabric.